Madison River fly fishing is some of the best in Montana. After flowing in from Wyoming, the Madison River joins with the Jefferson and Gallatin Rivers near Three Forks before flowing into the Missouri. 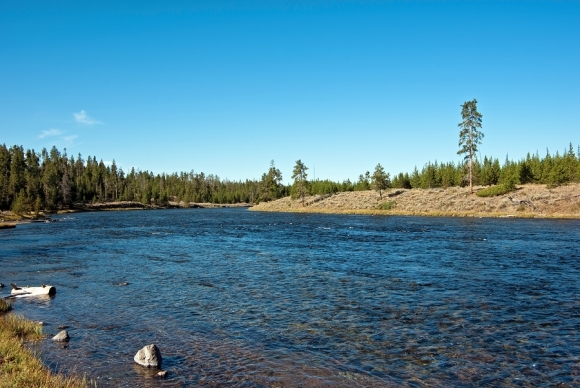 Meriwether Lewis gave the river its current name in 1805. Many veteran anglers make fly fishing trips to the Madison River every year because of the breathtaking scenery and fine fishing it offers. Rainbow trout, brown trout, and mountain whitefish are all abundant in the Madison. The different sections, from upper to lower, offer many different types of terrain, ranging from areas suitable for beginners to areas with more difficult fishing suitable only for seasoned experts equipped with the best fly fishing gear. To fully explore the Madison River, you should sign up for a guided fly fishing trip with experienced locals. Certain areas are closed to guide boats at certain times of year, and it helps to have a seasoned guide to help you avoid fishing in restricted areas.